OmniTik 5 PoE ac features five Gigabit Ethernet ports and support for 802.11ac. It’s equipped with a powerful 720MHz CPU, 128MB RAM, high power 1,300mW 802.11a/n/ac Dual Chain wireless (support for AC as well as backwards compatible with regular 802.11a/n CPE) and comes with a new design weatherproof outdoor enclosure, two integrated 7.5dBi 5GHz omni antennas, a power supply, a PoE injector and a mounting kit. It also supports passive or standard 802.3at/af PoE input/output. Ethernet ports 2-5 can power other PoE capable devices with the same voltage as applied to the unit. Less power adapters and cables to worry about! It can power af/at mode B (4,5+)(7,8-) compatible devices if 48-57 input voltage is used. 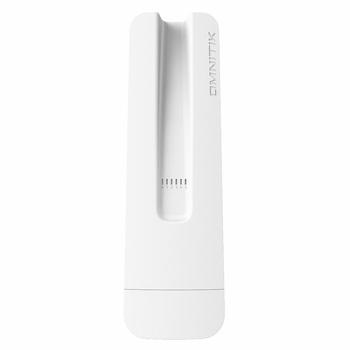 OmniTIK 5 PoE ac US (USA) is factory locked for 5170-5250MHz and 5725-5835MHz frequencies. This lock cannot be removed.